Rooney’s recent history has been marred with a couple of scrapped albums, do-overs and disputes, so it’s encouraging to see the band bucking up and finally releasing another record. But Eureka sounds like the quintet has grown even more jarringly disjointed. 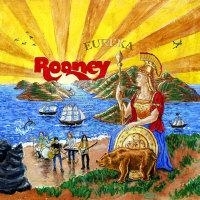 Rooney now lurches from chirpy pop to vintage-y surf-rock tracks, few of which are memorable. A handful of Eureka’s songs, like lead single “Can’t Get Enough,” are decent, and the uncharacteristically belligerent “Not In My House” is even quite enjoyable, but these shine alongside some pretty awful stuff. “Stars and Stripes” is a nauseatingly didactic sermon that sounds utterly parodic, but the band sounds serious in preaching about changin’ the world, complete with sickening harmonies comparable only to the boy-bands of the mid-1990s. Despite the mildly pleasant pop tracks scattered throughout, the choking dissonance makes Eureka an incongruent mess.